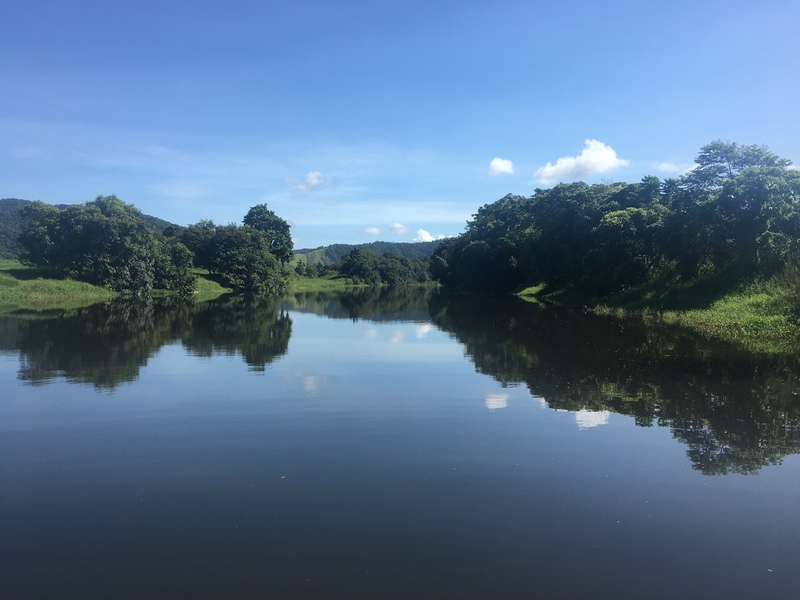 The mighty Daintree River rises in the Great Dividing Range behind Port Douglas. It flows north through this mountainous World Heritage listed rainforest region before completing its horse-shoe shaped path to the Coral Sea. It is not a big river by world standards, but during the monsoon wet season huge volumes of warm tropical water flows strongly through this ancient landscape past ancient rainforest trees, the oldest in the world. The lower reaches of the fresh water zone are centred on Daintree Village and broaden to include backwaters and many species of fresh water mangrove trees guard its banks. Further downstream the inter-tidal zone offers another unique feature of this magnificent waterway. The humble mangrove tree, probably the most important plant species on the globe, is evident as a tall forest like fortress as well as low scrubby bushes. Their unique root structure, mangroves breathe through their roots, forming huge buttresses along the channels near the delta mouth. Over twenty species of mangrove trees are found in this system. Crocodiles also inhabit these waters. The leaves of these plants act as tiny desalinators, removing the salt from the water and enabling the trees to thrive in such an otherwise harsh environment. Once they have completed their task, they fall to the mangrove floor, rotting amongst the trapped sediment and mud. It is this humble process that fuels the entire system. The rotting vegetation is the start of a complex food chain that will eventually “feed” the Great Barrier Reef”. This region offers such a beautiful scenic backdrop, the pleasure of fishing seems almost secondary. During the “wet” summer months the river flows warm and strong. Nutrients and sediment are flushed from way upstream. It is a time of plenty, and our prime tropical sportfish are in breeding mode. They are hungry. The best time to fish the upstream sweet water reaches is a few days after heavy rainfall. As the flooding river returns to its main channel, small gutters and creeks flow food rich waters into the main stream. Barramundi patrol these food stations and they are aggressive feeders at this time of year. Any backwater or eddy is also a productive if you are to toss a shallow six inch lure. Most fish are juveniles however, averaging around 4-6lbs, but don’t be surprised to encounter much larger specimens over 30lb occasionally. Mangrove Jacks and GT’s will also travel way upstream to the fresh to gorge themselves while Jungle Perch and Sooty Grunter are common captures if the water is relatively clear. Drifting downstream on the current, casting repeatedly to the preferred lies, can produce 10-20 barra on good days. The swaying beds of ribbon grass and lilly pads also a prime target area. The pre and post-wet season is probably the best time of year to fish our tropical rivers. Barras and Jacks love the warm water, the food supply is plentiful, the fish are hungry in preparation of spawning and the weather conditions more predictable for the visiting angler. 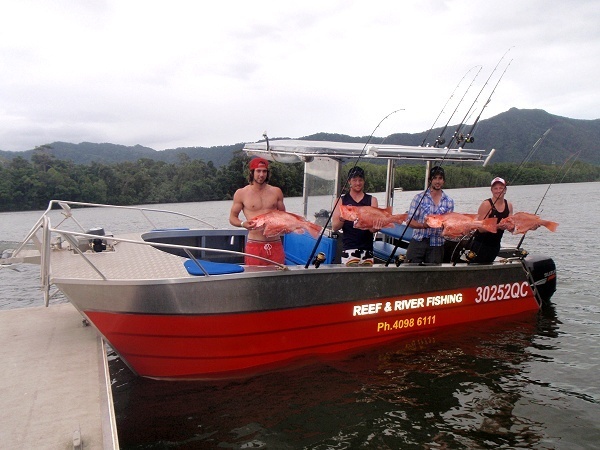 On good tides, medium movement of about one and a half metres is best, anglers can fish from the Daintree township (fresh water) right down to the river mouth. Shallow running lures work best upstream in the shallows and weed beds while a deeper diving lure is more productive around those mangrove roots mentioned above. The salt water can produce more Barra, Jacks, Barracuda, GT’s, and Cod. The largest river and salt water Barra are encountered at this time of year and lure techniques are discussed more fully in the Rigs And Bait section. Bait fishing is a little unpredictable while the river is flooding, or on the big tides, and is best during the cooler months before and after wet season. During the cooler months, from June to September, the water quality is at its best. The salt will penetrate further upstream as the fresh clears bringing schools of sardines and other bait fish into the system. The predators follow! Metre long Queenfish patrol the sand bar edges, gutters and drop off and the ever present GT’s are at their prime best. Live sardine baits pinned through the nose on a 4/0 hook and drifted down the current lines can produce exciting captures of these silver acrobats. Use as little lead as is necessary to hold the bait on a running sinker rig with at least a metre of mono leader. Grunter (Javelin Fish) also enter the system to breed at this time of year and fish to eight pounds are common. Small grunter can be in plague proportions at times and these fish are probably the most common captures throughout the north. 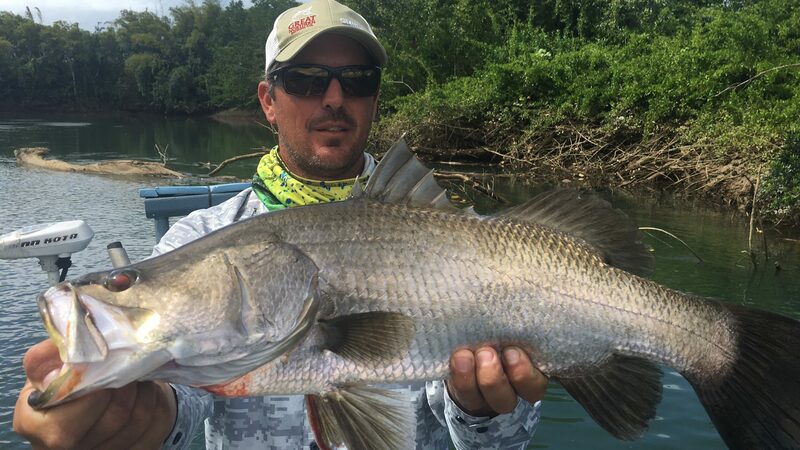 Big grunter prefer big strip baits but will take sardines and fresh prawns which can be caught using a cast net along the shallows, mangrove roots and any upstream facing structure offering shelter for the current. Other species caught at this time of year include Flathead, Sickle Fish, Estuary Cod and Bream. 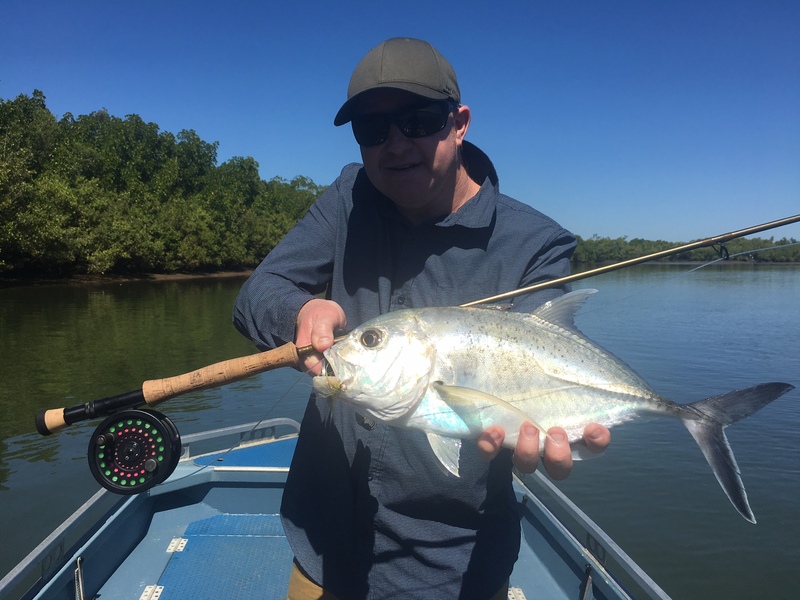 Lure fishing will produce GT’s from the mangrove lines channels, Queenfish from the sand bar edges, Flathead from the shallow sand and mud bottom, Estuary Cod from the structured areas as well as small Jacks and the occasional Barramundi from the warmer sun-lit shallow flats and weed beds. As usual tides and weather conditions will play a major part in any fishing success. The mid range tides are best for river fishing and the better the weather up here, the better the fishing. Follow the tides in and out of the system with the most productive periods being around the change. Fish deep water on slow moving tides, shallow gutters etc. on fast moving tides. Look for obvious signs like current lines, splashing bait fish, eddies, mangrove roots, weed beds and any drainage bringing dirty water and food into the river. The best tide for lure fishing is one with about one and a half metres of movement. The bottom of the tide usually being the most productive as the deeper snags are more exposed and readily accessible to the lure.